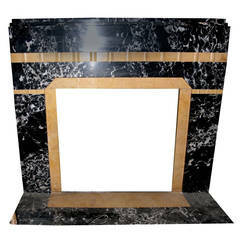 Antique Fireplace in black portoro marble and Siena yellow, Art Deco, complete with base, first half of the 20th century top 116 x 29 D x H cm 107, mouth 70 x 73 cm, rare in excellent condition, many were destroyed after the second world war, original and complete, perfect for an environment of the early '900, very elegant thanks to the black marble and furnishing. Antique fireplace made of Nero Portoro and Giallo Siena's marble. 20th century ceramic fireplace whit marble plain anda basement. Measure external 162 x 120 H cm, measure internal mouth 67 x67 H cm. 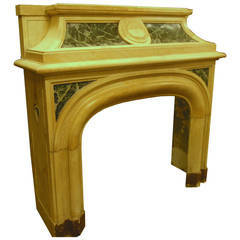 18th century fireplace made of Carrara Michelangelo marble and giallo Siena.